HATTIESBURG, Miss. 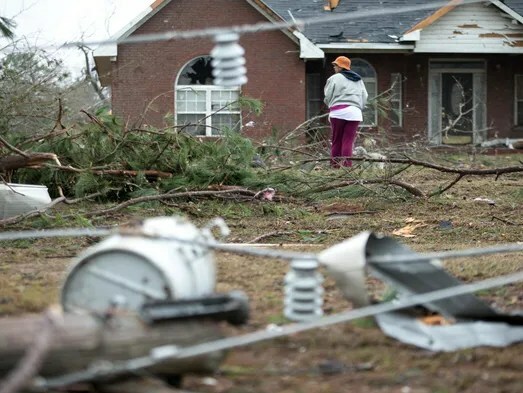 — At least 4 people were killed in southern Mississippi early Saturday when a destructive tornado roared through the Hattiesburg area, leveling homes, ripping off roofs & tossing trees into roadways across the region. The city of Hattiesburg on Twitter & Forrest County emergency management confirmed the deaths. Forrest County Coroner Butch Benedict said 2 of the fatalities were in a trailer park. According to Benedict, the victims were identified as Ernest Perkins, 58, & David Wayne McCoy, 47, who were found in the trailer park, Simona Cox, 72, & Cleveland Madison, 20. Numerous injuries were also reported in the city of 48,000. The tornado ripped through the area around 4 a.m. w/strong winds that caused extensive damage in several blocks of Hattiesburg. As dawn broke, city residents awoke to find trees, massive limbs & poles wrapped in power lines littering the streets next to decimated & severely damaged homes. Nearly 15,000 homes & businesses were w/out power. “The total debris clean-up will be weeks at this point,” said Lee Smithson, executive director of the Mississippi Emergency Management Agency. South of downtown Hattiesburg, Edna Smith examined her now roofless home. The tornado tossed most of her roof into the backyard & alley, leaving rain free to stream inside where it turned wallboard into mud & soaked upholstered furniture. At the Hattiesburg Salvation Army, Captain Patrick Connelly began assessing the damage. “Before 1st light, I could tell there were windows blown out & standing water in the buildings,” he said. Connelly said the destructive winds peeled back the roofs on nearly every building of the campus, which includes a homeless shelter, church sanctuary, administrative offices & a Boys and Girls Club for after-school programs. “This won’t stop us. In fact, we will have feeding trucks on our campus feeding lunch to those in the area who are in need,” he said. Forrest County Emergency Management Agency Director Glen Moore said there were multiple reports of people trapped in homes. State & local emergency responders coordinated on rescue missions in the pre-dawn hours of Saturday as another line of severe weather swept through. Mayor Johnny DuPree signed an emergency declaration for the city, which reported significant structural damage, AP reported. Smithson said Gov. Phil Bryant is traveling back to Mississippi after attending President Trump’s inauguration & will sign a sate of emergency declaration. Nearby Lamar & Perry counties & the city of Petal were also hard hit. Petal Mayor Hal Marx urged residents to stay home. Emergency personnel are out working to clear roads & there are multiple areas of downed power lines & gas leaks. The National Weather Service’s preliminary reports indicate the tornado ranked as an EF3 w/wind gusts estimated between 136 mph & 165 mph. However, the weather service said many of the hardest-hit areas had not yet been assessed. The initial tornado warning went out at 2:57 a.m. w/38 minutes of lead time before the tornado began its destructive path. 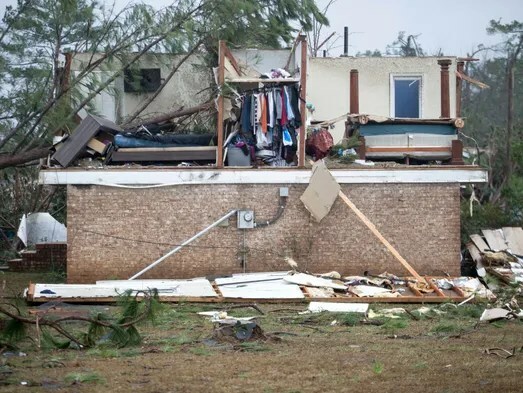 The severe weather slammed several counties in the area, causing extensive damage, the Mississippi Emergency Management Agency reported. Interstate 59 north of the city was closed due to debris & downed power lines. Search & rescue teams were dispatched to help local authorities, who urged residents to avoid traveling. William Carey University’s Hattiesburg campus closed & students were being escorted from the area, the school announced on Twitter. Arrangements were being made for students who couldn’t make it home. Some dorms were damaged in the storm & some students reported minor injuries, the university tweeted. At 1 point, students at the Hattiesburg campus of the University of Southern Mississippi were directed to take cover. The university also reported extensive flash flooding at several locations on campus. The National Weather Service said 3 to 5 inches of rain fell, raising the threat of flooding. The National Weather Service said more severe weather is expected in the area between 4 p.m. & midnight. Meteorologist Latrice Maxie said there is the danger of more tornadoes, but the greatest risk is farther north. The line of storms will also push east later Saturday across parts of Alabama, Georgia, northern Florida & far southern South Carolina, bringing the chance of damaging winds, hail, flash flooding & tornadoes. On Sunday, the thunderstorms are expected to form into a squall line with a high risk of damaging winds & the potential for a few tornadoes, AccuWeather reported.